China's three-person crew will test techniques for docking and inhabit the Tiangong space laboratory. When China's fourth human spaceflight blasts off on June 16, it will mark more than the country's latest crewed space mission. The Shenzhou 9 space docking mission will launch China's first woman astronaut into orbit and ferry the first crew to a space station prototype. Liu Yang, age 34, is China’s first female astronaut. She and two colleagues form the crew of the Shenzhou 9 mission, with liftoff set for 6:37 p.m. local time (6:37 a.m. EDT or 1037 GMT) on June 16, 2012. 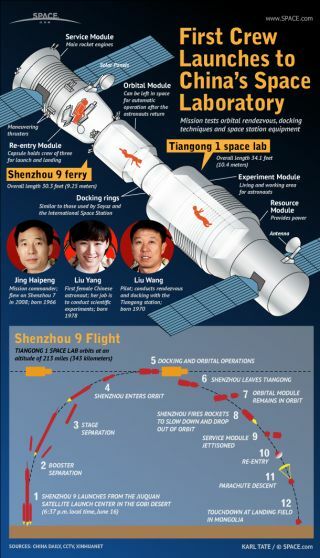 The astronauts will travel to the Tiangong 1 space laboratory, which has orbited the Earth since Sept. 29, 2011. Pilot Liu Wang, 43, will practice both manual and automatic docking maneuvers. The crew will inhabit the space laboratory module for several days to conduct experiments and test equipment. The mission’s commander, Jing Haipeng, 46, flew in space once before on the Shenzhou 7 mission in 2008. The Tiangong 1 laboratory is a prototype for a more elaborate space station that China plans to launch by the year 2020. Tiangong 1 is 34.1 feet long (10.4 meters) and 11 feet in diameter (3.35 meters). The laboratory orbits the Earth at an altitude of about 220 miles and an orbital inclination of 42 degrees. The Shenzhou ferry spacecraft is 30.3 feet long (9.25 meters) and 9.1 feet in diameter (2.8 meters). Shenzhou’s pressurized crew capsule houses three astronauts for launch and landing. A module at the front of Shenzhou can be left in space for automatic operations after the crew has returned to Earth.